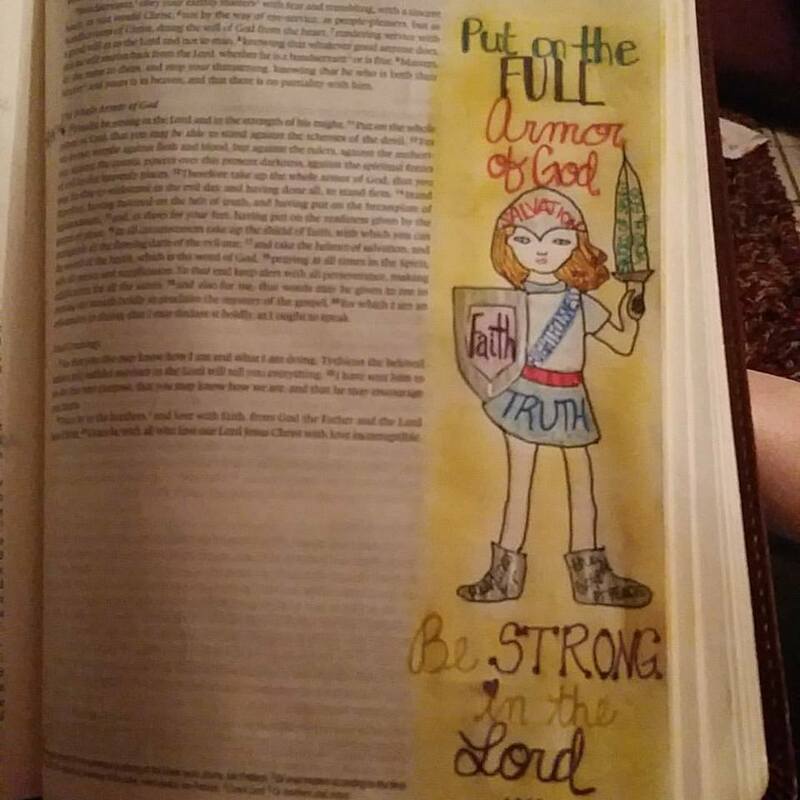 The past few weeks, our pastor has been preaching a series on the Armor of God. We missed a couple weeks due to sickness and being out of town but this morning, he brought the Word with great force. He talked about how the struggles we go through are calculated moves by the enemy. We don't see these moves and so often we focus on what we see in front of us. But if we are to have victory in the midst of these struggles, we have to address the source and we have to throw up our shield of faith. He gave a scenario that hit home for me. He talked about girls (or boys too) that grow up in a home where dad has decided to leave. He gave other options too - like physically there but emotionally unavailable fathers, abusive fathers, etc. I just happen to fall into the first category. He discussed the often times sad results of a girl who grows up without her father. She tends to grow up searching for anything and anyone to fill that void, that dad-shaped hole. She listens to the conniving and manipulative lip service of boys who only want for one thing. She doesn't see her worth. And because she continues to seek love in literally "all the wrong places" she continues to be hurt. The cycle goes on. I sat there thinking, That could have been me. With the scary statistics surrounding girls who grow up without dads, that probably should have been me. But it wasn't. Praise God---it wasn't. You see, thankfully, I had a mother and other great people in my life who taught me about that shield of faith. That shield keeps the fiery darts of the enemy from fully reaching you. Trust me, I had plenty of darts sent my way as I was growing up. I'm so grateful, though, that I grew up in a home of faith. I'm convinced my mom prayed that shield over our home. I knew my relationship with Christ is what kept me from a lot of stupid decisions, but I knew others who had a relationship too and they succumbed to some choices that did not honor God. Now I feel that what made me different from others who grew up in similar situations is that shield of faith. I've always had a strong faith and I see now that my faith is what kept me grounded. It helped me realize my worth as a child of God, a daughter of the King. I may not have always felt worthy...but I knew in my heart that I was. I'm certainly not immune to the fiery darts of the enemy. And I'm not perfect so sometimes when I rely on my own strength, my arm gets tired of holding the shield and it comes down. And I feel the results of a faith that's not being practiced. Those darts come in the form of insecurity, complacency, negativity, judgement...these are some of the things the enemy uses against me. When my shield is not up, those darts get to me and they cause me to listen to the lies spoken by the enemy. 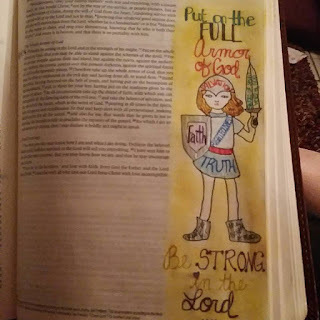 Obviously, all parts of the armor of God are of great importance...otherwise it wouldn't say, "Put on the FULL armor of God." But that shield may just be slightly more important. You can have all the other pieces of the armor on and ready but if that shield is not up, those darts will reach you and they will inflict damage. Keep your shield up. Keep it poised and ready. Your faith will defeat the enemy. Photo taken by me: artwork mine (well, I traced the girl).